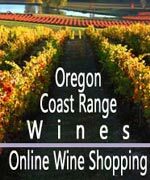 (Cannon Beach, Oregon) – Busy and abuzz are the two words you can often apply to the north Oregon coast hotspots of Cannon Beach and Seaside. 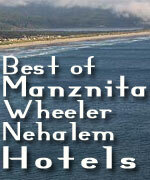 The pair are known as resort towns for a reason. 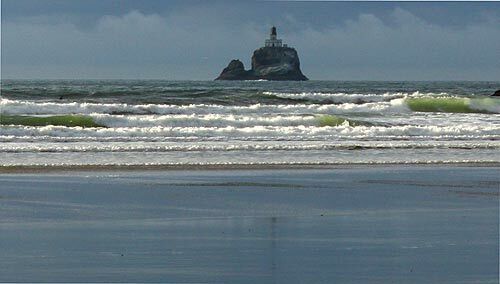 (Above: seeing the Tillamook Rock Lighthouse from Indian Beach). They have some parts not explored by quite everyone, however. If you're a first-time visitor, you'll find pleasures a plenty, with gobs of things to do for all ages, and all sorts of attractions to bring them in and keep them. But both have a path slightly less traveled as well. These come in handy should you wish to get away from the crowds, but also because they have some points of interest you may not know about. At Cannon Beach, there is Indian Beach. 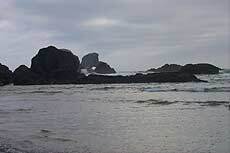 One outstanding feature at Indian Beach is the rock structure in the diastance called "Goonies Rock," because it was used in a famous scene in the movie, "Goonies." At the northern end of Cannon Beach's Ecola State Park, another 1.5 miles after the main part of the park, you'll find a crescent-shaped beach filled with cobblestones, where a there's a lovely view of Tillamook Rock Lighthouse and where numerous rocky shapes stand and get slammed by large waves. At the cove's southernmost end, you can amble over some large boulders and reach more rock slabs to sit on, perfect for watching the water rage against other wedges that dare stand against it. This rocky semi-circle is enclosed by two headland areas, with maybe a quarter mile worth of walking area. Granted, during most winters, it's mostly covered with stones and doesn't have much in the way of flat sandy areas, so it's not the best spot for lying around. But it is undeniably beautiful and cozy, with a viewpoint and a picnic table sitting above its northern end. 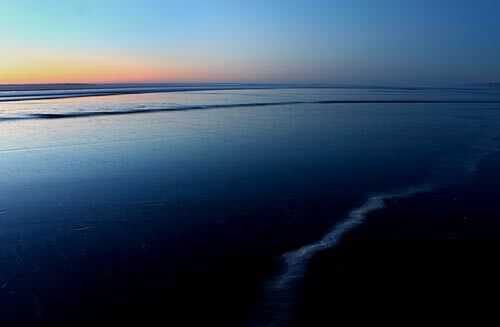 During summer, spring and fall, there is usually more walking area because of higher sand levels. At the parking lot for Indian Beach is the main trailhead going over Tillamook Head. It's another six miles to Seaside from there. Different Sides of Seaside and Gearhart. 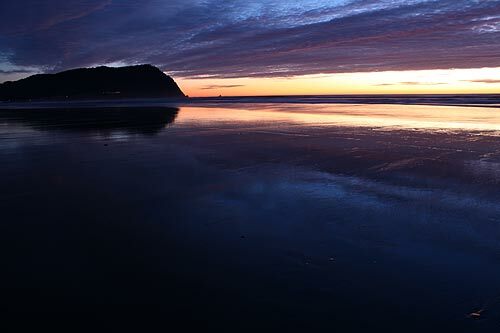 Seaside is the big buzzer on Oregon’s coast, with lots of things to do for kids, their parents, romancers on a getaway or younger twentysomethings looking for something a little off kilter in a beachy way. Gearhart, in the meantime, is its very quiet partner, separated by only a river. The main drag of Seaside, Broadway, is filled with a variety of touristy shops and attractions, restaurants of varying degrees of finery and a few bars that are legendary hotspots during any time of the year. At the beachy end of the street is the historical “Turnaround,” which sits in the middle of the also ancient Promenade – a mile and a half walk along a charming path that overlooks the strand. You’ll find another Lewis & Clark landmark just south of the Turnaround, and the Gilbert District lets you disappear into the past a bit. 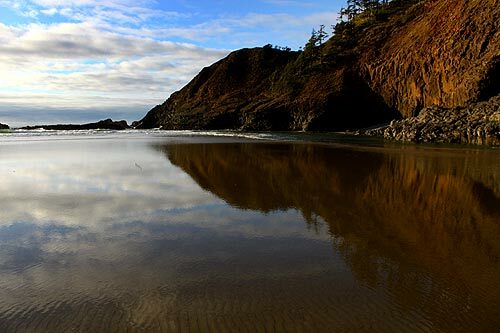 If you’re looking to get away from it all, the northernmost end of Seaside’s beaches, at the river mouth, provides some intrigue and mystery – with rarely a soul here. At any regular glance, it looks completely average, perhaps even slightly boring and featureless. But it cloisters a treasure trove of unbroken sand dollars – likely the most you’ll ever find on any beach on Oregon’s coast. Part of this has to do with the fact no one seems to spend much time in this area, so the goodies don’t get picked. 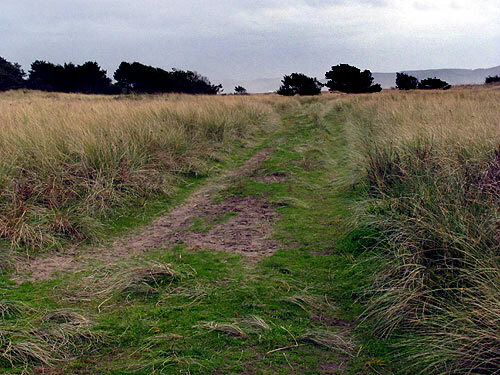 This landscape looks a lot like Gearhart at this part of Seaside, with its large tufts of grass-covered dunes providing a massive border between the beach and the higher ground beyond the vegetation line. It’s at Gearhart where serious peace and quiet takes over, with a town not geared to tourists – at least not very much. Poke around at the southern end, however, where the beaches take some walking to from these charming streets. There’s a stretch to the north where driving on the beach is legal, so it’s way more populated and the sand is unclean and greasy because of the vehicles. 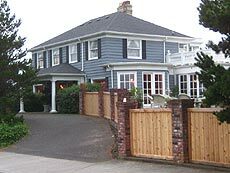 The other big attraction of Gearhart is the proliferation of old and stunning upscale homes, with some slightly resembling the mansion from that “Hotel California” album cover by The Eagles. This tour is a guaranteed jaw-dropper. More on Seaside below and at the Seaside, Oregon Virtual Tour, Map. More on Cannon Beach below and at the Cannon Beach Virtual Tour, Map.